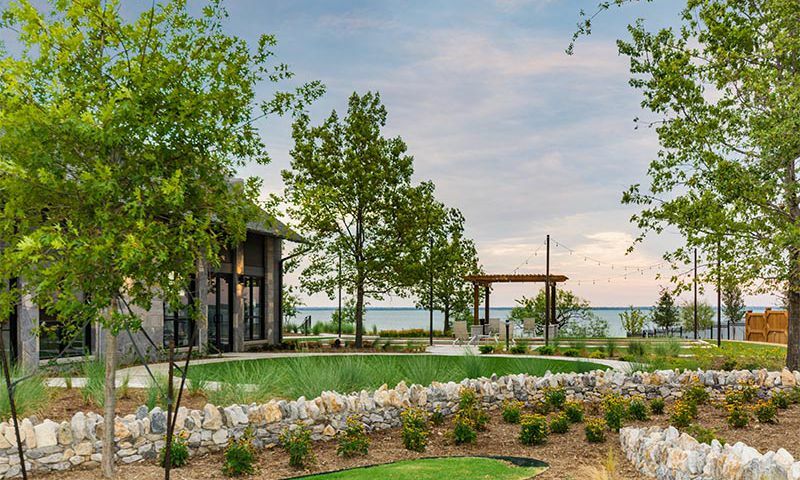 On the coast of Lake Lewisville resides the Waterford Point at The Tribute's community clubhouse. There, residents have access to a fitness center and aerobics studio as well as private massage rooms, great for unwinding after a good workout. Two ballrooms are available as well as a catering kitchen, perfect for making snacks for parties and events. Outside, is an infinity pool that looks out onto the lake as well as a patio for homeowners to enjoy. Play a friendly game of bocce ball on the courts that is just outside the clubhouse. An event lawn is available for large gatherings. Homeowners are able to gather around the lakefront fire pit with friends and neighbors for a relaxing evening while enjoying the beauty of Lake Lewisville and the surrounding natural space. Residents also have access to the 33,000 square-foot, master-planned community clubhouse and the surrounding amenity centers in The Tribute. The Tribute includes access to two pro shops, two golf courses, several restaurants, pubs, and amenity centers. The community has 6.7 miles of walking and biking trails, boat slips into Lake Lewisville, and over 200 acres of natural spaces. Taylor Morrison began construction on Waterford Point at The Tribute in 2017. Upon completion, the community will consist of 417 single-family homes in four separate collections, totaling 17 different floor plans with many options and styles. The Haven Collection includes four different plans ranging in size from 1,601 to 2,119 square feet. They have two bedrooms, two or two-and-a-half bathrooms, and attached two-car garages. These homes have large walk-in closets in the master suites, outdoor living areas, and some include options such as fireplaces, extended outdoor patios, and flex spaces. The Harbour Collection features five floor plans. They range in size from 2,015 to 2,361 square feet of space. They have two or three bedrooms, two to three bathrooms, and attached two-car garages. In addition to large master suites, some plans offer options like three-foot garage extensions, outdoor fireplaces, and sliding doors to the outdoor living spaces. The Maritime Collection includes four floor plans ranging in size from 2,438 to 2,952 square feet. These homes include two or three bedrooms, two-and-a-half or three-and-a-half bathrooms, and two or three-car garages. They include large open family rooms, outdoor living spaces, and options like bay windows in the master bedrooms, dry bars, and outdoor fireplaces. The Regatta Collection is the largest collection of homes offered at Waterford Point at the Tribute. It offers four floor plans that start at 3,155 square feet and go up to 3,787 square feet of living space. These large homes come with three bedrooms, three-and-a-half or four-and-a-half bathrooms, and attached three-car garages. They come with large family rooms, study and flex spaces, and some have additional options such as in-law suites, additional bedrooms, and outdoor kitchens. Homeowners in Waterford Point at The Tribute live in a relaxed, resort-style community. Located on serene Lake Lewisville, residents have unequaled opportunity to enjoy their waterfront access, canoe and kayak launches, and their own beachfront clubhouse for events and activities. With an on-site lifestyle director available to all residents at The Tribute, there will always be fun clubs to join. Get some exercise by joining an aerobics class and relax afterwards with a massage. Residents of The Tribute can play tennis at the Lake Club amenity center or attend holiday parties and special get-togethers year round. The two golf courses in the community provide endless days of opportunity to play. No matter what your interests or hobbies are, you'll be able to pursue them with ease at Waterford Point at The Tribute. Located in The Colony, Texas, Waterford Point at The Tribute is right off FM 423 and just a short drive away from Interstate 35E, making driving near and far a breeze. When traveling farther is needed, DFW International Airport is a 30-minute drive. Baylor Scott & White Medical Center is just 15 minutes away. For shopping and entertainment, Stonebriar Centre is a 20-minute drive away with 186 different stores and restaurants. In the same direction just behind the mall, Dr. Pepper arena is the home of the Dallas Stars NHL team. No matter what you love to do, there is plenty nearby Waterford Point at The Tribute in The Colony, Texas. Clubhouse - 33,000 Sq Ft. There are plenty of activities available in Waterford Point at The Tribute. Here is a sample of some of the clubs, activities and classes offered here. The Haven Collection includes four different plans ranging in size from 1,601 to 2,119 square feet. They have two bedrooms, two or two-and-a-half bathrooms, and attached two-car garages. These homes have large walk-in closets in the master suites, outdoor living areas, and some include options such as fireplaces, extended outdoor patios, and flex spaces. 55places.com is not affiliated with the developer(s) or homeowners association of Waterford Point at The Tribute. The information you submit is distributed to a 55places.com Partner Agent, who is a licensed real estate agent. The information regarding Waterford Point at The Tribute has not been verified or approved by the developer or homeowners association. Please verify all information prior to purchasing. 55places.com is not responsible for any errors regarding the information displayed on this website.